Well, since he has walked with me for more than half of his lifetime, and to thank him for always being there by my side, I thought I really should put in some effort to grant his wish. After reading up on how to make an ice cream cake, I made up this Oreo Ice Cream Cake...which was choked to the brim with layers of oreo cookies. The base was a layer of oreo crumbs, which I covered with a tub of Cookies & Cream ice cream. I even added some oreo chunks into the ice cream layer. Next came the chocolate ganache layer...and it was generously dusted with oreo crumbs before topping off with more oreo cookies! 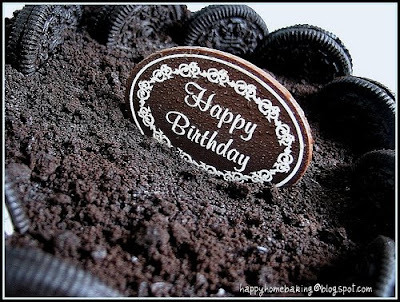 The only thing that had got nothing to do with oreos was the chocolate birthday 'card'. It was among one of the many goodies given to me generously by VB. Thank you VB! It was a very good experience coming up with this cake since this is the first time I have ever made an ice cream cake. It was actually much simpler than I thought. I used a loose bottom pan for the cake...and since I do not have any appropriate plastic sheets to line the sides of the pan...I improvised by using long strips cut from a cookie bag. You need lots of patience when making this cake. It has to be well chilled before unmolding. I tried to unmold it when it was only in the freezer for 2hrs...as I thought the surface looked well set...but the ice cream started dripping from the sides when I tried to release the pan. I quickly returned it to the freezer and tried it again 4hrs later...and it came off nicely! Line the sides of a loose bottom pan with plastic sheets. Set aside. Place oreo crumbs and melted butter in a bowl. Mix thoroughly with a spoon until the crumbs are moistened. Press the crumbs evenly into the base of the prepared pan. Use the back of the spoon, smooth out the crumbs and press firmly. Freeze the base for at least 1 hour. Soften the ice cream at room temperature. When the ice cream is soft enough, place it in a mixing bowl. With a spoon or spatula, stir the ice cream until it is spreadable. Spoon the ice cream over the oreo base, ensure all gaps are filled. Depending on the depth of the pan, fill it with enough ice cream till it reaches about half to one inche before the rim. Cover with a cling wrap and freeze for at least 2 hours. When the ice cream layer is set, prepare the chocolate ganache. Place cream and finely chopped dark chocolates in a bowl over a pot of simmering water. Stir till the chocolate melts complete. Leave to cool off. This step has to be done as quickly as possible. Spread the chocolate ganache over the ice cream layer. Decorate as desired. Cover with cling wrap and freeze for at least another 6 hours before unmolding. When ready to unmold, dampen a kitchen towel with hot water and wrap it around the pan and hold it there for about 10seconds. Remove the towel and unmold. After unmolding the cake, return it back into the freezer to firm up before serving. i was thinking about ice-cream cake the other day and wondering how to go about it. And there you are! WOW! your cake looks absolutely yummy!will definitely try it sometime soon! i have to try out the strawberry cake 1st. Cheers! hi hi, you've been tagged! that looks so delicious and so professional! i'm sure your husband appreciated the cake! thanks for the instructions/recipe. i think i will have to try this! thank you! Yum! Looks (and tastes, I bet) amazing! My mouth is watering now!!! love your "if you give a...." title. We always loved those books. Oh HHB! How I wish I could have a slice! Hehe...i think you can sell it already..outside have not seen it yet.. LOL! Ida, Thanks for your encouragments! Chrystal, I dont have a bifg freezer too. As long as you can fit in a 18cm pan inside your freezer, you will be able to make this cake. Hi Anonymous...yes, this cake is great for the summer heat, which we experience almost everyday here! Bridget, if I am not wrong, we have read thru the whole series of "If you give a..."! and I love those books, and won't mind reading again and again and again! 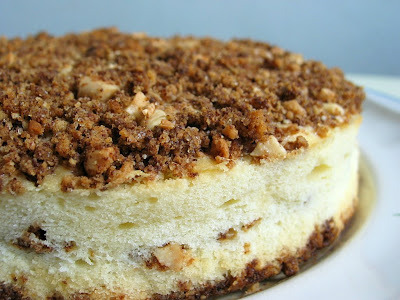 anyone can make this cake...even w/o a loose bottom or springform pan, this can be done quite easily. You should make your own...if you don't like oreos, u can replace it with digestive biscuits...and you can choose your favourite ice cream flavours and play around with the toppings. Wow, ice cream cake. Looks gorgeous. Think it's gonna be something that I'm gonna make soon. Thanks for giving me the idea. hehe... You have a great blog here. Love it. oh yes, forgot to ask another question, what software r u using to add text to your photos? Hi Lina, happy belated birthday!! SSB, so, are you a oreo cookie lover too? Hi Katherine, you should give this a try! dear WF, thanks for your encouragement...I already have my own bakery...ie the one in my kitchen :) and my poor family members are forced to pretend to be the customers, lolz! Thanks Cutie...I can't wait to hear about your ice cream cake! Hi Yuri, it's always fun and yet very stressful to bake a bday cake for your love ones! I'm sure u will experience the anxiety very soon! I used the editing tool within the Flickr website to add in the text. This is the tool that I have been looking for ages...simple and easy to use! have fun! May I know what is Nestle Pouring Cream and heavy cream? Where can I buy them? Hi Michelle, are u a local? you can get the nestle pouring cream at any of the local supermarkets here. It comes in a small can and available at the shelves at the baking supplies section (not refrigerated). You can also choose to use heavy cream...available at cold storage. I usually use this brand "Bulla". You did a beautiful job on that cake -- WOW! Never tried an ice cream cake on my own; have only eaten Dairy Queen's (nummy!). Definitely going to give this a go on my own, thanks! That looks so delicious. I've always wanted to make an ice cream cake. Thanks for the directions! What can I say. Simply marvellous. Looks so good. Happy belated birthday to your hubby. The only flaw in this cake is that it is flawless!Lovely! I've just discovered you blog and I'm inspired to try this out. Do you think it'll work with half the recipe? Thanks, HHB. I'll keep that in mind. But one more question, how do I unmold if I dont have a loose bottom pan. Can I just use a normal round baking tin? Do I line it with cling wrap or a foil? Hi Nich, I think it will be quick tricky if you dont have a loose bottom pan for this ice cream cake. You can line a normal pan with either cling wrap or foil, however, the sides will not be smooth due to the crumbled foil/wrap. One way to overcome this is...after the cake is unmold, you can swipe a hot palette knife (dipped in hot water & wiped dry) around the sides to smoothen it a bit and then put it back to freeze again...but I am really not sure whether this will work. The cake is definitely delicious. However, the chocolate ganache I did seemed to shrink at the sides after it was left to freeze. What did I do wrong ??? I used the nestle milk cream and hershe baking chocolate. Hi Su, I am sorry, I'm not clear what you meant by the ganache shrinking at the side? could you care to elaborate? The ganache was spread evenly on top of the cake. After I took out from the freezer, the chocolate is only at the center and I can see an outer ring of icecream. It seemed to shrink from the sides. Is it because the consistency of the ganache is too thick? Hi Su, oh dear, I've not encountered this before! It's really strange that the chocolate ganache would shrink that much. I could only suspect that the melting of the chocolate was not done properly. I'm sorry I won't be able to give much comment on this due to my limited knowledge. I just want to know which kind of dark chocolate you used?What brand?. hi Beebee, are you a local? For this cake, I used dark chocolates bought from Carrefour...their house brand. It comes in a pack of 2, each at 200g (about $5 a pack). There are these words on the packing "Dessert Corse" and "chocolate extra-fin, pur beurre de cacao". It has a 64% cocoa content. I really want to use your recipe for my brother-in-law's birthday cake. I'm going to give it a go this weekend so I'm prepared. My question is, and it might be a bit silly, exactly how frozen is it after 6 hours? My brother-in-law lives 20 minutes away from me and it would be impossible to finish the cake at his house. I was just wondering if there was anyway to get around the cake melting on the way over?! I'm not sure whether I read you correctly, are u concern about bringing the unfinished cake from your brother-in-law's house back to your own home, or is it the other way round? I am not sure how frozen is it after 6 hours, but if you really intend to bring it over, do freeze it over night, at least you are certain that it is well frozen. I would think it it better to bring the cake before unmolding (together with the pan), so once you reach his place, you can pop it into the freezer to let it set again before serving. I found something related on this link: (http://chowhound.chow.com/topics/417017) hope you find it relevant. Hi Mushroom, it was also my first attempt at making an ice cream cake. I guess the oreo crumbs turn hard due to the freezing. I made the cake and posted pictures and description on my blog. Please take a look. I also posted a link back to you so that everyone knows where to go for the best ice cream cake! Is the nestle pouring cream the same as nestle La Lechera. I live in Chicago il and it is a very sweet and thick cream. What size spring form pan would I use? Hi Anonymous, I used a 18cm or 7" pan. Are you referring to nestle La Lechera sweetened condensed milk? No, I am not using condensed milk for the ganache, I am using Nestle pouring cream which has got 25% milk fat. I think it is called Table Cream in the USA. You can always use other brands of heavy cream. whenever i need chocolate, i will buy them from carrefour too. its quite cheap considering that they sell 400g for 5bucks. good deal! . and most importantly the quality of chocolate is pretty good for its price.normal chocolates from supermarket sell for like 5plus for maybe 100 to 200g. i have tried both "Dessert Corse" and "chocolate extra-fin, pur beurre de cacao". pretty decent. i just realised i bought the wrong cream... i go and buy thickened cream :( can i used this cream? and the amt to be use? Hi Elaine, you can use thickened cream, the amount to use is the same, 1 cup. Hi. I tried making this but the after around 5 hours the ice cream is kinda like..soft..its like when u touch it u can compress it and then bounce back out abit...and there'll be a lil stain on my hand...any advice? Hi Tasmin, have you covered the ice cream cake with the chocolate ganache when you mention that the ice cream is still soft? It is ok, if you have not covered it. After covering with the chocolate ganache,it is best to chill the cake over night, as it really depends whether your freezer is cold enough (especially if it is full, it may take a longer time for the ice cream to freeze). Once left over night, it should firm up. What is cling wrap? Sorry as this is a stupid question to ask. Hmm, how do you decorate the first layer with oreo? The oreo seem to be cut off till half then you place it onto? Hi Anonymous, a cling wrap is a clear plastic sheet that clings tightly to keep food fresh. You can take a look at this site here (http://www.glad.com/plasticwrap/clingwrap.php). Yes, I cut the oreo cookies into halves before placing them on top. Is heavy cream same as thick cream? Hi, yes they refers to the same thing. may i know what flavour did u use for the ice-cream in the recipe? Hi Pohling, I used 'Cookies & Cream' ice cream. thanks..im goin to make the cake now :D i hope it will be a great success! WOW this is MY dream birthday cake! I just made an ice-cream cake for my bf's birthday cos' ice-cream is his favourite dessert. It's freezing in the freezer now. Wasstill soft just now. Hopefully it'll be successful! Will let you know ow it turns out! I found one kind of nestle cream that says, "Pure dairy sterilised cream". The instruction says, "add milk for pouring". Is that what you are using? How do I know how much milk to add? Hi Huiqi, you don't have to add milk to make this chocolate ganache. Hi. can i ask where you get heavy cream or pouring cream?? and the oreo cookies weight 110g before crumbled or after? Hi Anonymous, I get heavy cream (I ususally use this brand Bulla) or pouring cream (Nestle) from NTUC of Carrefour. The oreo cookies weight 110g before crumbled, I removed the white filling before crushing them. You can use a measuring scale to weight the chocolates to get 150g. Hi, Need help on the amount of cream. 1 cup will convert to how many grams or ml? Thanks for your advice. Hi, I am sorry, I do not have the measurement in grams. I used a liquid measuring cup to measure out the cream, which is 250ml. i really like your blog! u r a great baker! I made this cake somewhere in Nov and i intend to make this again this week. the previous time i make, the ganache doesnt stick to the icecream layer. i wonder y? do you pour the ganache over the icecream layer while its hot or cool it? i've also waited for the cake to set for abt 3-4 hrs. Hi Stephanie, I let the ganache cool off before pouring. I didn't have problem with the chocolate layer separating from the ice cream. Strange, I wonder what's the cause? Am thinking to put some sponge finger somewhere inbtw the ice-creams.. Not sure if it'll taste any btr =p at least a portion taste like cake then all ice-cream for a ice-cream cake. I don't know about the texture for the sponge fingers when they are chilled? and you would probably need to chill the cake when it is half-filled with the ice cream before placing the sponge fingers, otherwise, maybe, they wont stay in the middle?? For the base, and the top, I remove the cream from the oreos. I kept the cream on for those that I mixed in wit the ice cream. Hope this helps. I have tried your Ribena Cheesecake and it turned out well. My friends love it. 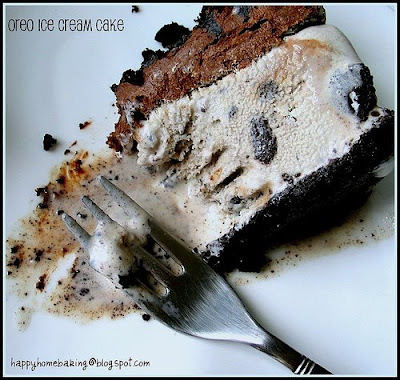 I am going to try this oreo ice cream cake soon. I would like to ask if Bulla Pure Cream is the heavy cream you have mentioned? I was not able to find heavy cream in Carrefour when I was buying the ingredients. 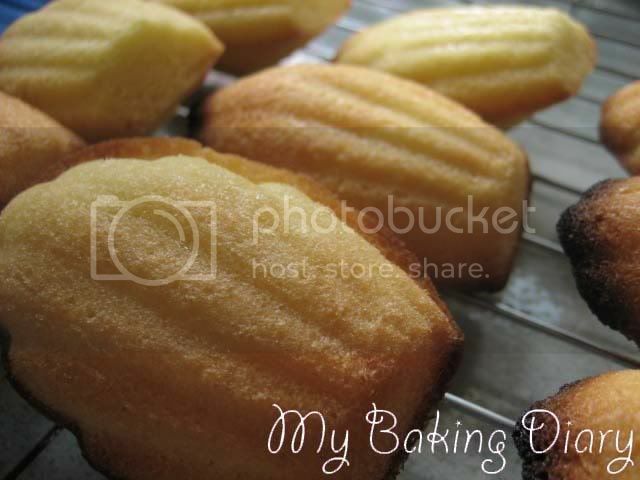 Hi Baking Noob, I used Bulla Thickened Cream (not pure cream), you can get it from cold storage or carrefour. 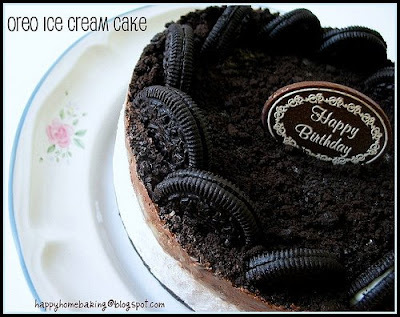 I absolutely love Oreos and this cake looks delish! I've always wanted to try making an ice cream cake, but I have always been nervous. Your post makes it seem like it would be quite easy. I'm so excited to try this! I've been a HUGE fan of your blog since last year. And have tried a few of your recipes. and i'm glad to say being only 19 years old, they turned out pretty good. Tmrw is my brother's birthday and i would love to make this cake for him. So i would like to ask if you have any advice at all to give me before i make it tmrw? Just any additional details i might need to remember as i'm still not quite a professional at this baking area. Especially since this would be my first ever ice-cream cake. 1.) the heavy cream you used for the ganache, can i use whipping cream instead? I always use whipping cream for ganache's. 2.) if i want to add a layer of sponge cake before the ganache and after the ice cream is that possible? Or do i add it elsewhere if i want to? Thank you so much. You're blog has definately been an inspiration. The ice cream cake is quite straight forward, the only thing to watch out for is the timing. You need to prepare in advance so as to allow time for the ice cream layer to set. 1) You can use whipping cream for your ganache. I think i will not go with having the sponge cake since it would be too big of a risk. I'm just afriad that the ice cream would melt and etc when we take it out to cut. Will it? What if i do it tonight and let it stay in the freezer overnight until tmrw(sat) dinner time? Will that be too long and in the end freeze the entire thing up? Great recipe and very useful instructions. Made them yday in a reduced quantity and it was very delicious. Thanks for sharing :) Have linked the recipe to you on my blog. I'm a fan of your page and know a few other friends who are too! Your recipes are really good. Thanks for sharing them! 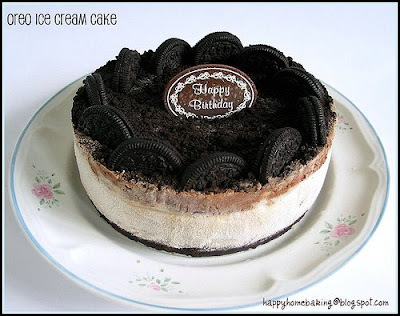 I'm thinking of baking this Oreo ice cream cake for my hubby's upcoming birthday. Just wondering if I can use baking chocolate chips in place of dark chocolate? Based on your experience, will it harden as I leave it to cool? I like cheesecake hope to make one for my hubby who cooked well, baked cake. I hope to do one for his birthday. As i never bake a cake myself. Hi shiryu chen, I am not sure what you meant by which Recipe to buy? do you mean where to get the necessary ingredients? How to cut the ice cream cake nicely? How to line the baking pan using plastic sheet? Only line the base or together with the sides? Can use compound droplets chocolate for the chocolate ganache? Any issue if I mix with baking chocolate chips n chocolate rice together with compound droplets chocolate since I have left over? If I use yr suggested method to decorate the top 30mins before serving so as not to let them lose the crips, will it last till the 2nd day? Whenever I put the cake inside the fridge to freeze it, needs to cover? I understand I need to use cling wrap at first, wat about towards the end? As mentioned in my post, I lined the sides with plastic sheets cut out from cookie bags (not those thin clear plastic bags available at supermarkets). Just cut long strips according to the height of the pan and use it to line the sides. I didn't line the base of the pan as I serve the cake with the base. You could line the base with parchment paper if u want to. The oreo crumbs will turn soft after u leave it over night. Yes, do cover the cake every time u leave it in the freezer. Thank you for ur prompt reply. How to achieve a nice slice cut of the ice cream cake? Hi Bebe, yes, same as cutting cheesecake. I made this cake yesterday using your recipe and it turned out great. The family loves it. Thank you for sharing the recipe and hope you will continue to keep up with the blog as it has been a great inspiration for many!